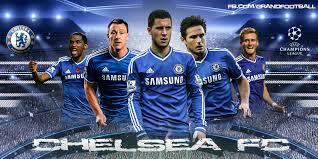 It's no longer news that chelsea fc has some real problems especially in their defense. They have leaked quite a number of goals to the extent that you wonder if this is the same team that had probably had the tightest back line that earned them the title -'parking the bus ' club . All this has changed this season with every team getting the better of Chelsea,just 4 points out of a total possible of 20,this is certainly what we expect from a title defending team. It's time for any good punter to exploit this situation at least till the next transfer window come January . 1.trying to keep teams away from their goal line means more CORNERS for the opposition and if they go a goal down ,then they will go all out to attack resulting in more CORNERS for them as well . RESULT -OVER 10.5 is good stake . 2.They concede goals but have a very good scoring rate as well. 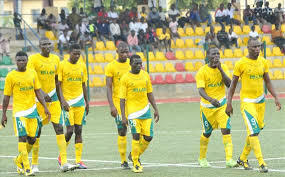 3.In a bid to curtail the other team, the players will commit blunders resulting in YELLOW CARDS,MAYBE RED TOO. RESULT -OVER 2.5 CARDS FT.
4.CHELSEA CLEAN SHEET -NO is another good stake at least till that back line is reinforced . Bearing these in mind,it up to you to use this opportunity to make something good of a bad situation even if you support chelsea like i do. How To Start A New Betting Season - The Right Way ! It's a few days to the start of the new football season and i can't wait to set my punting strategies in motion. I believe most punters worldwide have this same feeling,but wait; it's a fresh season -how do i start well and maintain my winning tempo? This is what i'll be sharing with you in this short but useful write up. b.there might have been transfers in and out of a team new players need to settle in. 2.Never ACCUMULATE up to 3-4 matches in one league especially EPL. b.don't assume that same teams that performed well last season still have the same winning form. 3.Avoid the newly promoted teams at least in the first week -you really don't know the players so don't place bets on these teams . 4.Avoid teams whose top scorer left for another team likewise if a team had over 6 new transfer deals in the last few days before league started -its a new team altogether . 5.Your best bet market is 1X even if the odds are quite low,it better to win and keep greed away -you have the whole season ahead of you. 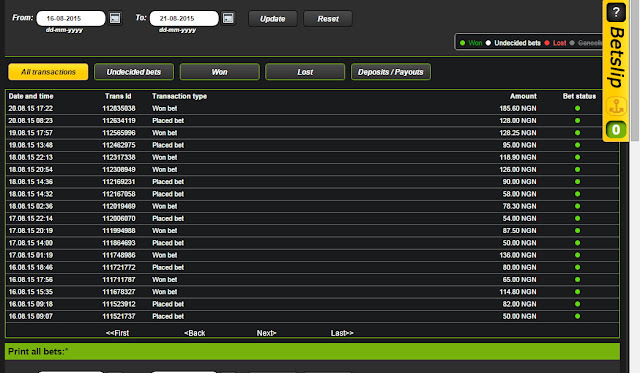 7.Start with low bets maybe 100-200 naira per game and gradually build up your account. 10.No betting on week day games please. With these few tips i wish you a happy punting season . DAMOLA ADEOYE, writing on the rise in the wave of sports betting, explores the details behind an obsession fast creeping into the mind of the average Nigerian. Can it truly be said to be a reward for passion? ORDINARILY, it shouldn’t have elicited any interest; neither a star game, as football die-hards are wont to say, nor had the trappings of a must-watch. The match between Dnipro and Met Donetsk was a hugely important one, not only to the players sweating it out in the cold land of Ukraine, but to about 30 or so young men seated at a popular betting centre along Poly road, Sango, Ibadan, and a handful of other betting centres scattered across the country. Shifting edgily from side to side, the young men- this reporter inclusive, awaited the final score of the match, as it was part of a list of others many of them had staked on. For this reporter, Dnipro was expected to win. When the game finally ended in a draw, it was bad news. That betting has become a big attraction to sport fans in Nigeria in the last three years or there about is no longer news. The only revealing thing perhaps, is that from the educated to the half-literate, fans have been staking millions of naira on matches played in different leagues across the world, with each correct prediction providing a whopping return on investment. This, to Sakiru Olatunde, a 28-year-old student of the Polytechnic Ibadan, is the real reason behind his continuous participation. 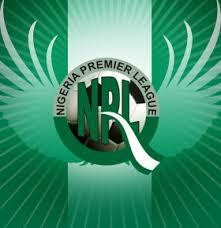 “Imagine, with just N100 and a correct prediction of 15 matches, I can earn close to N20,000. Do you think I want to stop that kind of thing?” he asked. 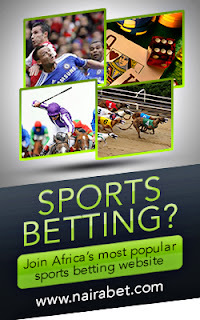 Popular sports betting platforms currently operating in Nigeria include 9jabet, Nairabet, Merrybet, 1960bet, Fortunebet, Surebet, 360bet, Lovingbet and several others. With the realisation that football fans that have supported their beloved clubs for free can now earn ‘cool money’ from a successful wager, sports betting has now spread like fire in the harmattan. “In every five minutes distance, one will probably come across not less than five betting centres, especially in the big cities,” submitted Olatunde. Most football viewing centres that had previously showed matches for a fee have now caught the bug; many already converted to betting centres. To Femi Ibikunle, an agent with 1960bet, sports’ betting is a very lucrative business as the commission itself is enough to take one home, as civil servants often say. 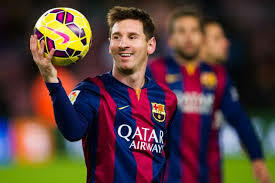 “There are several sports one could bet on- basketball, tennis, snooker, cricket and football. One could also bet on animals—dogs’ and horses’ races are also usual bets too.” He, however, added that football was the one that drew the highest crowd of betters. Ibikunle, who said he already had a football viewing centre before working as an agent, said he registered with the sum of N30,000 and bought a few laptops to aid the business. Since then, business has been good. One very interesting thing about the language of betting is its cultural relativity. Though most betters speak pidgin which is more or less the official language of the street, the mother tongue of the better is often pre-eminent. Hence for Yoruba betters, words like re si i which means ‘to place a bet’ is the lingua franca. When the better wins, he says mo je, the Yoruba word for ‘I’ve won’, while when he loses, with remorse and gnashing of teeth, he laments mo shan. Other words used by betters depend largely on their locale. While the words over, under and double chance have been explained by this reporter’s ‘lecturers’, the term ‘handicap’ is one for critical analysis. It simply means that though the weaker team scores first in a game, it might end up losing. Otherwise, the stronger team may be predicted to score first and still end up losing. The odd in this case is usually higher. Sola Bammeke, who identified himself as an avid better, eagerly explained the process of completing a multiple bet for instance, to this reporter when they met at a bet9ja shop recently. Aside betting on the final score, one could also bet on the number of goals a particular match will produce. Bammeke, continuing with the ‘lecture’, said; “O/U 1.5 which has over 2 goals with 1.42 odd means the game is expected to produce more than two goals. Should it end with less than, then the bet is lost, while under 1.5 with an odd of 2.65 means the game mustn’t record up to two goals. Should that be the case, the bet is lost,” enthused Bammeke. The elderly man snapped, saying; “that O/U 4.5 means there’ll be more than five goals or less than in the game. ‘Over five goals’ has 7.72 as its odd while ‘under five goals’ has 1.05. Any deviation from this prediction means an automatic loss of one’s bet,” the man called baba by those who know him said. Bammeke, however, added that should one stake on the first 10 minutes of any match, one’s concern would be on that duration alone and happenings in the remaining 80 minutes or thereabout aren’t one’s business. Citing the Nantes-Toulouse game, 1X2-10 mins is a bet concerned with the first 10-minute of the game. Should one bet on 1 with 8.28 as its odd, Nantes is expected to be winning by the first 10 minutes of the game, while 2 whose odd is 9.67 implies a Toulouse win in the same duration. X with 1.13 odd is a draw. Olatunde, who later strolled over to where the trio were discussing, claimed he only staked on football as the outcome to him was natural, at least to some extent, unlike the dog or horse race that, he alleged, had been computer programmed. “As you can see yourself, many people aren’t betting on animals. The belief is that the computer determines how much a person wins,” he quipped. When a person wins, this reporter learnt, the person is paid either by cash or through the fellow’s bank account. One has till kick-off time of any match to place one’s bet. 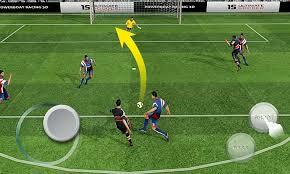 While such bet can be placed in the offices and shops of betting agents, online betting is another option. “Usually when you play online, your personal bank account is attached as you create an account,” volunteered Olatunde. The amount to be won, he added, is determined by the accuracy of prediction as well as the amount staked, as the actual prize money is determined by multiplying the odds with the amount staked. The experiences of Bammeke, Olatunde, Olagoke and other avid betters may have lent credence to a recent study conducted by the News Agency of Nigeria (NAN). In the said study, about 60 million Nigerians between ages 18 to 40 are believed to be spending close to N1.8 billion on sports betting daily. The study showed they commit on average N3,000 daily. This claim, according to Opeyemi Ogedengbe, a public affairs commentator, could be true, giving the number of youths who throng various betting centres around his Ojoo, Ibadan residence. In his view; “betting provides a sort of engagement [job] for many youths. Instead of them just loafing about, they would be at those centres where they can watch games for free and earn some cash, if they are lucky.” The claim that the betting outfits are providing opportunities for unemployed youths to earn some money was strongly supported by Ibikunle. “I employ no fewer than five people in my shop. Imagine if every betting shop employs the same number of people, don’t you know how many that’ll translate to?” he asked. Mr. Peter Igho, former Director-General of the National Lottery Regulatory Commission (NLRC) himself admitted that lottery, which sports betting is a critical part of, is helping the country solve her unemployment debacle. “Now we have staff in most of the states, to ensure our operations do not suffer. We have succeeded in creating employment for Nigerians, because in all those offices, we have a minimum of 20 employees. In the past two years, we have raised over N2 billion for the Lottery Trust Fund and that is still a drop in the ocean of what can happen,” he said then. Sports betting isn’t just a Nigerian thing; it is big business globally, as Emmanuel Adeoye, deputy editor, the12thplayer, a sports blog puts it. “Betting provides additional sources of financing for many mid-table teams in England. A team like West Ham and Stoke, for instance, make money from betting proceeds.” Betting is a legitimate and organised way of making legal money. “The only thing is that government at both state and federal level should step up control so that needed revenue won’t be lost and that standards would be maintained,” he concluded. That position is corroborated by Mr. Lanre Gbajabiamila, Chief Executive Officer Lagos State Lottery Board when he spoke with newsmen recently. “The Lagos State government has been making efforts to provide an enabling environment for the lottery industry but only 40 per cent of the industry had been tapped into. We urge the federal government to create a more enabling environment for operators in the industry to increase revenue and create jobs for youths,” he said. Since sports’ betting is a form of lottery regulated by the National Lottery Regulatory Commission, there is the belief that Nigeria could earn up to N250 billion annually if well harnessed. According to Mr. Adolphus Ekpe, Director-General of the commission, “lottery is something that can generate revenue for the government outside crude oil and other natural resources. Lottery is the next oil boom in the country. It will be very effective if Nigerians actually know how to go about it and they are not deprived the opportunity to go about it,” he said. Sports’ betting is loaded with risks, as this reporter himself learnt the hard way. For a multiple bet involving 15 matches, for example, all of them must be correct before one can win. Should 14 be correct and one short, then the bet is lost. Adeuyi, on his own, said he didn’t count much on his bets, as he saw it purely as a game of chance. “I don’t really get hurt when I lose, though it is usually painful when a huge amount has been lost, because of one single game!” Olagoke claimed to have quit betting because he hasn’t been winning. No matter the benefits betters ascribe to their trade, many still see it as a deviation from the normal. For Rachael Thomas, a psychologist, “betting is abnormal behaviour which shouldn’t be encouraged.” “How can you put a little money in something, without having done any work so to say, and expect huge returns?” she asked. She thus opined that such behaviours, though usually began in a small way, have the tendency of transforming into addiction which might be difficult to control later. “Once behaviour becomes an addiction, then trouble looms,” she added. Like Christianity, Islam also frowns on any form of betting, since it is believed to be another name given to gambling. 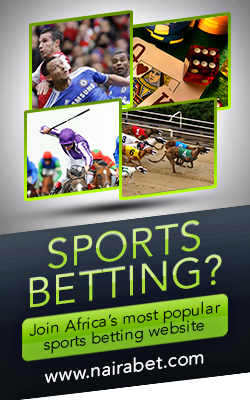 Whether for or against, the consensus of opinion remains that sports betting is now a fad among Nigerians. With its attendant benefits and disadvantages, the lure of ‘cool cash’ is simply irresistible. Gone are the days when pools staking and the ubiquitous lottery popularly referred to as Baba Ijebu were the in-thing, sports betting is now in charge. For the like of Olatunde, Bammeke, Baba and many avid betters who have sworn to a life of betting, they’ll continue doing so until they strike gold. Though some have since struck gold, reaping hefty returns, many continue sowing, with no hope of harvest in sight. Many of them, especially those already addicted to it, it was discovered, even borrowed money to stake, not minding the heavy burden of debt they had to shoulder. As for this reporter, his quest to nap N19,398.04 from N100 is story for another day. Having stayed till the late evening to see Dnipro draw Met Donetsk, which was the beginning of his bet hitting the rocks, three other games fell flat. In short, while 11 games were nice, four weren’t. Looking slyly at the bet slip and ruing the missed money, the experience of betters whose games fell short became very clear. “So this is how it feels to lose a bet?” he asked himself. Though Bammeke and Olatunde eventually comforted him, saying it was natural and that he’ll eventually strike gold one day, this reporter seems to have concluded in his heart that it is goodbye to betting! Now that football enthusiasts have turned to betting as a reward for their passion, regulatory agencies are advised to step up control and monitoring, so that best practices would be maintained, revenue tapped and a teeming number of youths guided rightly to find solace in their new found love. If you think you’re an avid fan and yet haven’t placed a bet before, you’re probably miles behind. —Additional report by Adeleye Ogunmosu. How long would it take you to earn a top footballer’s salary? You can even compare with several footballers and coach Jose Mourinho. This Free Report Reveals The Ten Common And Costly Football Betting Mistakes 98% People Make. Be Among The Remaining 2% That Earn A Consistent 5,000- 10,000 Naira Every Weekend. Handicap betting essentially adds points to one side or the other before the actual event. This is done to try and level the playing field between a competing underdog and favourite. If you see both sides with a handicap something is amiss or your bookmaker has been drinking. Steer clear of that! You should see only one handicapped side in a given match up. Betting handicap teams requires a bit of thought. For example, if the handicap adds 1 to the score of Germany, then it means that Germany are underdogs because they are being given a head start. So a bet could be taken on Germany to hold on to that positive handicap, by drawing or winning the match. If you wanted to bet on England overcoming their -1 Handicap, then they would need to win by one clear goal. Thus, if the regular match is a draw, the handicap match will show Germany as the winner. Another version of handicapping is known as Asian handicap betting, which applies to football. In some ways, Asian handicap betting is a gift to punters, because it eliminates one of the possible outcomes of a match. In a typical match, you would have a winner, a loser, or face a draw. With Asian handicap betting, the draw is no longer an option. Instead, the Asian handicap adds goals (whole, quarter, half and three quarter goals) so that there are no draws. While a whole goal handicap can produce an even result in a match, making a handicap drawn (a -1 handicap on a team winning 1-0 for example), in Asian Handicap betting, this instead is called a Push. A push always results in the punters getting their stake refunded. This is an intricate, yet easy to use betting system and because it does eliminate one of the possible outcomes, the odds are finely tuned with only bigger goal margins, or backing underdogs in positive market options, really paying off. The odds are very fine - they even go down to a quarter goal to allow the bookmakers to draw as fine of a line as possible. It's not a very profitable venture for bookies as you don't get long odds with this style. However, it does eliminate one of the possible outcomes which can simplify things - you won't make millions but you have an even shot at a prize. All in all, handicap betting adds a bit of variety to your wagering experiences. Be sure you understand the nuances before betting handicap odds so that you don't think you've won but end up a loser once the extra points are added on. Watch for Asian handicap betting if its football, but be sure that your expectations are in line with the outcomes so that you can be a cheerful one at the end of the day. Martingale system is invented by casinos. This wagering system is based on doubling your money after each loser bet and turning back to the first step after each winner bet. For instance, you staked 10$ on a %50 chance bet with 2.00 odds. If you lose the bet, you place X2 of your previous stake. You lose the 2nd bet too? So, you go on doubling your stakes until you win a bet. STEP 2 and so on. As you can see above, we won the 5th Bet and our profit will be 160$-(10+20+40+80)$ = 10$. It is the rule ofMartingale strategy. You get the same profit after any win anywhere. We won the 6th Bet too. Our profit is 10$ again after this winner bet. If we cannot win until 7th Bet, our total wager will be 1270$ (10$+20$+40$+80$+160$+320$+640$). Losing 7 in a row is not impossible and I am sure it can happen to even very best punters in long term. I want to tell you a story of me about this subject. 3 years ago, a friend of me came and sat next to me in a cafe and told me that we should have talk immediately. He was so excited that I could not resist his offer even if there were 2 girls next to me. We got out the cafe and he began to tell me his fantastic strategy which was supposed to be invented by him(!). It was surely Martingale; furthermore, my friend was extremely sure that he had found it first. We found a net cafe and I showed his so-called strategy was invented by someone else before. I mean Martingale strategy is not an essential and marvelous wagering strategy. Any of school children can invent it on his/her own. Nevertheless, a lot of punters use this strategy or something based on this as their premier wagering strategy. Maybe they don’t know how it is dangerous. We never suggest our members to use this system. This is absolutely non-sense and any bookmaker is absolutely happy when his members use this. In long term, there is no possibility to win money by Martingale. Bookmakers have their wager limits and they will not let you wager more than limits or you will bankrupt without a final winner bet.